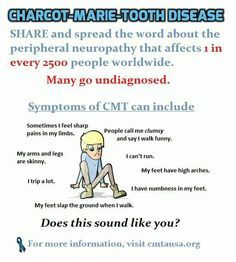 Charcot Marie Tooth Disease=CMT is inherited. It is not contagious, nor is it caused by anything in the environment. The most common forms of CMT are passed down from one generation to the next, meaning that it is dominantly inherited. In rare cases the gene mutation causing CMT disease is a new mutation which occurs spontaneously in the individual’s genetic material and has not been passed down through the family. There are many forms of CMT disease, including CMT1, CMT2, CMT3, CMT4, and CMTX. CMT1, caused by abnormalities in the myelin sheath, has three main types. CMT1A is an autosomal dominant disease that results from a duplication of the gene on chromosome 17 that carries the instructions for producing the peripheral myelin protein-22 (PMP-22). The PMP-22 protein is a critical component of the myelin sheath. Overexpression of this gene causes the structure and function of the myelin sheath to be abnormal. Patients experience weakness and atrophy of the muscles of the lower legs beginning in adolescence; later they experience hand weakness and sensory loss. CMT1B is an autosomal dominant disease caused by mutations in the gene that carries the instructions for manufacturing the myelin protein zero (P0), which is another critical component of the myelin sheath. CMT2 results from abnormalities in the axon of the peripheral nerve cell rather than the myelin sheath. 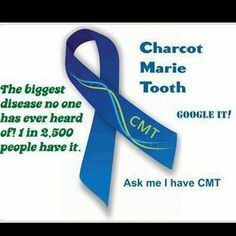 It is less common than CMT1. CMT4 comprises several different subtypes of autosomal recessive demyelinating motor and sensory neuropathies. Individuals with CMT4 generally develop symptoms of leg weakness in childhood and by adolescence they may not be able to walk. CMTX is caused by a point mutation in the connexin-32 gene on the X chromosome. Males who inherit one mutated gene from their mothers show moderate to severe symptoms of the disease beginning in late childhood or adolescence. Females who inherit one mutated gene from one parent and one normal gene from the other parent may develop mild symptoms in adolescence or later or may not develop symptoms of the disease at all. Diagnosis of CMT begins with a standard medical history, family history, and neurological examination. Individuals will be asked about the nature and duration of their symptoms and whether other family members have the disease. During the neurological examination a physician will look for evidence of muscle weakness in the individual’s arms, legs, hands, and feet, decreased muscle bulk, reduced tendon reflexes, and sensory loss. Doctors look for evidence of foot deformities, such as high arches, hammertoes, inverted heel, or flat feet. Other orthopedic problems, such as mild scoliosis or hip dysplasia, may also be present. A specific sign that may be found in people with CMT1 is nerve enlargement that may be felt or even seen through the skin. These enlarged nerves, called hypertrophic nerves, are caused by abnormally thickened myelin sheaths. If CMT is suspected, the physician may order electrodiagnostic tests. This testing consists of two parts: nerve conduction studies and electromyography (EMG). During nerve conduction studies, electrodes are placed on the skin over a peripheral motor or sensory nerve. These electrodes produce a small electric shock that may cause mild discomfort. This electrical impulse stimulates sensory and motor nerves and provides quantifiable information that the doctor can use to arrive at a diagnosis. EMG involves inserting a needle electrode through the skin to measure the bioelectrical activity of muscles. Specific abnormalities in the readings signify axon degeneration. EMG may be useful in further characterizing the distribution and severity of peripheral nerve involvement. Genetic testing is available for some types of CMT and results are usually enough to confirm a diagnosis. In addition, genetic counseling is available to assist individuals in understanding their condition and plan for the future. If all the diagnostic work-up in inconclusive or genetic testing comes back negative, a neurologist may perform a nerve biopsy to confirm the diagnosis. A nerve biopsy involves removing a small piece of peripheral nerve through an incision in the skin. This is most often done by removing a piece of the nerve that runs down the calf of the leg. The nerve is then examined under a microscope. Physical and occupational therapy, the preferred treatment for CMT, involves muscle strength training, muscle and ligament stretching, stamina training, and moderate aerobic exercise. Most therapists recommend a specialized treatment program designed with the approval of the person’s physician to fit individual abilities and needs. Therapists also suggest entering into a treatment program early; muscle strengthening may delay or reduce muscle atrophy, so strength training is most useful if it begins before nerve degeneration and muscle weakness progress to the point of disability. Stretching may prevent or reduce joint deformities that result from uneven muscle pull on bones. Exercises to help build stamina or increase endurance will help prevent the fatigue that results from performing everyday activities that require strength and mobility. Moderate aerobic activity can help to maintain cardiovascular fitness and overall health. Most therapists recommend low-impact or no-impact exercises, such as biking or swimming, rather than activities such as walking or jogging, which may put stress on fragile muscles and joints. Many CMT patients require ankle braces and other orthopedic devices to maintain everyday mobility and prevent injury. Ankle braces can help prevent ankle sprains by providing support and stability during activities such as walking or climbing stairs. High-top shoes or boots can also provide support for weak ankles. Thumb splints can help with hand weakness and loss of fine motor skills. Assistive devices should be used before disability sets in because the devices may prevent muscle strain and reduce muscle weakening. Some individuals with CMT may decide to have orthopedic surgery to reverse foot and joint deformities. The National Institute of Neurology Disorders and Stroke supports research on CMT and other peripheral neuropathies in an effort to learn how to better treat, prevent, and even cure these disorders. Go to striveforgoodhealth.com on Safety tips regarding halloween for kids. 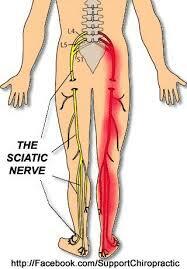 What is Sciatica Nerve Damage? The most common cause -a bulging or ruptured disc in the spine pressing against the nerve roots that lead to the sciatic nerve. *Narrowing of the spinal canal due to spinal stenosis. This spinal canal narrowing pinches on the sciatica nerve. *Bone spurs-they are growths that are small forming along joints caused by arthritis. 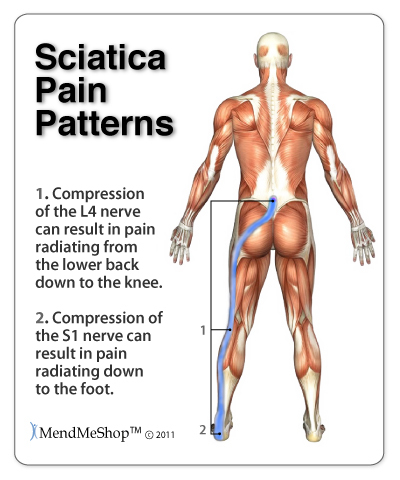 *Simply injury (like a car accident or fall) causing nerve root compression=again the same result-pinching the sciatica nerve. *Pregnancy-not as common as a cause as the others listed. *Rarely but also tumors could cause the problem also. 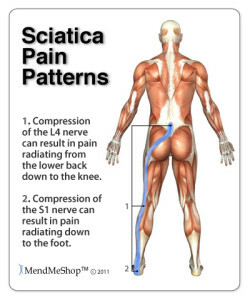 Symptoms of sciatica include pain that begins in your back or buttock and moves down your leg and may move into your foot. 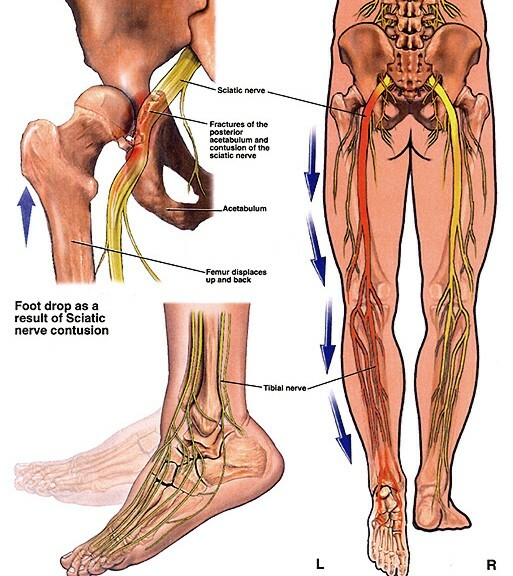 *Weakness, tingling, or numbness in the leg may also occur. *Sitting, standing for a long time, and movements that cause the spine to flex (such asexercises using the knee to chest) which may make symptoms worse. *Walking, lying down, and movements that extend the spine (such as press-ups) may relieve symptoms. *Avoiding sitting (unless it is more comfortable than standing). *Alternating lying down with short walks. Increase your walking distance as you are able to, without pain. * Takingacetaminophen (tylenol) or Motrin (Ibuporfen) or Advil or Aleve (Naproxen). All are nonsteroidal anti-inflammatory drugs which decrease the swelling of the inflammation around the area or injury to the back which will decrease the pain. More inflammation=more pinching on the nerve. *Using a heating pad on a low or medium setting for 15 to 20 minutes every 2 or 3 hours. Try a warm shower in place of one session with the heating pad. You can also buy single-use heat wraps that last up to 8 hours. You can also try an ice pack for 10 to 15 minutes every 2 to 3 hours. There is not strong evidence that either heat or ice will help, but you can try them to see if they help you. 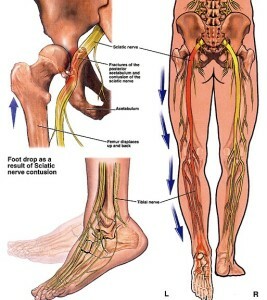 *Additional treatment for sciatica depends on what is causing the nerve irritation. If your symptoms do not improve, your doctor may suggest physical therapy, injections of medicines such as steroids, stronger medicines such as muscle relaxants or opiates. *Physical Therapy or chiropracter therapy or some form of therapy for 6 to 8 weeks. – scrapping of the vertebrae pinching the nerve with leaving the rest of the vertebrae spacing the spinal cord in place or removing the vertebrae pinching the nerve and replacing it with cement (not cement we use for sidewalks that we know of). It’s natural to want to return to your regular activities as soon as possible after surgery, but a lot depends on the type of operation you get. In two common methods, vertebroplasty and kyphoplasty, your surgeon makes a small cut in your back, which lets you recover faster. If you get spinal fusion surgery, the cut is larger, and it will take a longer time to heal. -Cold packs. Initially, you may get relief from a cold pack placed on the painful area for up 20 minutes several times a day. Use an ice pack or a package of frozen peas wrapped in a clean towel. -Hot packs. After two to three days, apply heat to the areas that hurt. Use hot packs, a heat lamp or a heating pad on the lowest setting. If you continue to have pain, try alternating warm and cold packs. -Stretching. Stretching exercises for your low back can help you feel better and may help relieve nerve root compression. Avoid jerking, bouncing or twisting during the stretch and try to hold the stretch at least 30 seconds. -Over-the-counter medications. Pain relievers such as ibuprofen (Advil, Motrin, others) and naproxen (Aleve) are sometimes helpful for sciatica. Michael Burgess (born 31 March 1946, is the Coroner of the Queen’s Household). Part 3 LET’S PREPARE FOR THE FALL, WINTER and SPRING BUGS. Know the facts and treatment on the flu. -Both colds and flu usually last the same seven to 10 days, but flu can go three to four weeks; the flu virus may not still be there, but you have symptoms long after it has left. Allergy can last weeks or months. -The winter flu epidemic will be coming around us again and in a given locality it reaches its peak in 2 to 3 weeks and lasts 5 to 6 weeks. Then is disappears as quickly as it arrived. The reason for this is not completely clear. The usual pattern is for a rise in the incidence of flu in children, which precedes an increase in the adult population. -The flu virus can lead to serious complications, including bronchitis, viral or bacterial pneumonia and even death in elderly and chronically ill patients. Twenty thousand or more people die of the flu in the America each year. Know this that the frequency of human contact across the world and the highly infectious nature of the virus make this explanation difficult to accept. 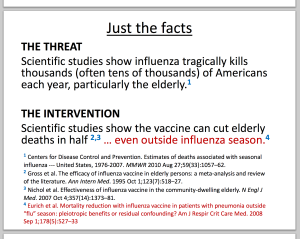 Moreover there is no evidence of persistent or latent infection with influenza viruses. In any case, this idea is not really very difficult from the notion that the virus circulates at a low level throughout the year and seizes its opportunity to cause an outbreak when conditions allow. -Even harder to explain is why the flu disappears from a community when there are still a large number of people susceptible to infection. Than even harder than that is why flu is a winter disease, which is not fully understood or known. However, flu is spread largely by droplet (aerosol) infection from individuals with high viral level in their nasal and throat secretions, sneezing, and coughing on anyone close at hand. The aerosol droplets of the right size (thought to be about 1.5 micrometers in diameter) remain airborne and are breathed into the nose or lungs of the next victim. -Situations in which people are crowded together are more commonly in cold or wet weather and so perhaps this contributes to spreading the flu at these times. It is interesting that in equatorial countries, flu occurs throughout the year, but is highest in the monsoon or rainy season. Enough about facts but onto logical thinking for when we or someone we know has it and what questions we might be asking ourselves. Are the treatments for these illnesses the cold or the flu different? For any of these things, if it affects the nose or sinus, just rinsing with saline that gets the mucus and virus out is a first-line defense. It’s not the most pleasant thing to do, but it works very well. There are classes of medicines that can help the flu — Tamiflu and Relenza — antivirals that block viruses’ ability to reproduce and shorten the length and severity of the illness. But they have to be taken within 48 hours or the cat is proverbially out of the bag [because by then] the virus has done the most of its reproduction. For a cold or flu, rest and use decongestants and antihistamines, ibuprofen, acetaminophen, chicken soup and fluids. Zinc supposedly helps the body’s natural defenses work to their natural capacity and decrease the severity and length of a cold. Cells need zinc as a catalyst in their protective processes, so if you supply them with zinc, it helps them work more efficiently. You should also withhold iron supplements. Viruses use iron as part of their reproductive cycle, so depriving them of it blocks their dissemination. The majority of these infections are not bacterial and do not require [nor will they respond to] antibiotics. My rule of thumb is that a viral infection should go away in seven to 10 days. If symptoms persist after that, you’d consider if it’s bacteria like Strep or HaemophilusHYPERLINK “http://www.sciam.com/article.cfm?id=how-much-aids-vaccine-do” HYPERLINK “http://www.sciam.com/article.cfm?id=how-much-aids-vaccine-do”influenzae. Those bacteria cause illnesses that are longer lasting and need antibiotics for ranging 3 to 14 days, depending on the med used. Is that treatment approach the same for kids versus adults? In general, the same rules apply: Most children will have six to eight colds a year in their first three years of life, and most are viral. Adults have 3 or more a year. It’s very easy to test for strep and for that you should have a [positive] culture [before treating with antibiotics]. The principle behind that is knowing the organism the doctor will know what antibiotic to use to fight off the bacterial infection and you won’t build up antibodies from the antibiotic that you didn’t need in the first place if you are given the wrong antibiotic in the beginning. Are the strategies for avoiding cold and flu different? Avoidance is very similar: Strict hand washing, not sharing drinking cups or utensils, and avoiding direct contact with people who are sneezing. Their transmission is similar. As long as someone has a fever, they have the possibility to transmit infection. After they’ve had no fever for 24 hours, they’re not infectious anymore. The U.S. Centers for Disease Control and Prevention (CDC) now recommends that just about everyone get the flu shot: kids 6 months to 19 years of age, pregnant women, people 50 and up, and people of any age with compromised immune systems. Is the shot beneficial to anyone who gets it? Unless you have a contraindication, there’s no reason not to get it=PREVENTION. Contraindications include egg allergy (because the vaccine is grown from egg products), any vaccines within a last week or two, and active illness at the time of your vaccine. Live a healthy lifestyle overall=Good dieting, living good healthy habits and maintaining exercise with rest daily or 2 to 3 times a week including get a vaccine yearly for the flu with maintaining good clean anti-infection habits like as simply as washing the hands as directed above. If you need help in being given the knowledge in how routinely lose weight if not maintain your good weight, knowing what foods are lean to leaner to leanest out of the 4 food groups, understanding why portions of meals including exercise balanced with rest is so important, how all 4 interact with each other impacting your metabolism rate, and keeping a healthier body with a higher chance of increasing your immunity with fighting off simple colds to possibly the flu when near someone contaminated with the virus and making this a regular part not just a few months to a year but for life then you came to the right blog. This is provided through Dr. Anderson and myself as your health coach if you need one in where we help you get started on this goal in your life. You can order Dr. Anderson’s book “Dr. A’s healthy habits” that provides the information on foods to help you lose the excess of weight with so much more in learning about the body to diseases in prevention and Rx. Most important, you make all the choices. I needed to lose weight and lost what I wanted. So if you want to prevent getting the cold to the flu with so many other diseases and illnesses go to healthyusa.tsfl.com and join what I did for a starting help. Take a peek for no charge, no obligation and no hacking. I hope you have learned something new from my blog. 1-Wikipedia “the free encyclopedia” 2013 website under the topic Influenza. 2-Kimberly Clark Professional website under the influenza. Those bugs that are common in fall and winter are 2 Viruses =The COLD and THE FLU. Both influenza and the common cold are viral respiratory infections (they affect the nose, throat, and lungs). Viruses are spread from person to person through airborne droplets (aerosols) that are sneezed out or coughed up by an infected person, direct contact is another form of spread with infected nasal secretions, or fomites (contaminated objects). Which of these routes is of primary importance has not been determined, however hand to hand and hand to surface to hand to contact seems of more importance than transmission. The viruses may survive for prolonged periods in the environment (over 18 hours for rhinoviruses in particular=a common virus for colds) and can be picked up by people’s hands and subsequently carried to their eyes or nose where infection occurs. In some cases, the viruses can be spread when a person touches an infected surface (e.g., doorknobs, countertops, telephones) and then touches his or her nose, mouth, or eyes. As such, these illnesses are most easily spread in crowded conditions such as schools. The traditional folk theory that you can catch a cold in prolonged exposure to cold weather such as rain or winter settings is how the illness got its name. Some of the viruses that cause common colds are seasonal, occurring more frequently during cold or wet weather. The reason for the seasonality has not yet been fully determined. This may occur due to cold induced changes in the respiratory system, decreased immune response, and low humidity increasing viral transmission rates, perhaps due to dry air allowing small viral droplets to disperse farther, and stay in the air longer. It may be due to social factors, such as people spending more time indoors, as opposed to outdoors, exposing him or her “self” to an infected person, and specifically children at school. There is some controversy over the role of body cooling as a risk factor for the common cold; the majority of the evidence does suggest a result in greater susceptibility to infection. The common cold (also known as nasopharyngitis, rhinopharyngitis, acute coryza, head cold) or simply a cold is a viral infection of the upper respiratory tract which primarily effects the nose. There are over 200 different known cold viruses, but most colds (30% up to 80%) are caused by rhinovirusesThis means you can pass the cold to others, so stay home and get some much-needed rest for yourself and not passing it on to others for the contagious period at least. If cold symptoms do not seem to be improving after a week, you may have a bacterial infection, which means you may need antibiotics, which only kill bacterial infections not viral. Sometimes you may mistake cold symptoms for allergic rhinitis (hay fever) or a sinus infection (bacterial). If cold symptoms begin quickly and are improving after a week, then it is usually a cold, not allergy. If your cold symptoms do not seem to be getting better after a week, check with your doctor to see if you have developed an allergy or inflammation or the sinuses (sinusitis). Influenza is commonly referred to as “the flu”, this is an infectious disease of birds and mammals caused by RNA viruses of the family Orthomyxoviridae, the influenza viruses. The most common sign or symptom are chills, fever, runny nose, coughing, aches and weakness to headache and sore throat. Although it is often confused with other influenza-like illnesses, especially the COMMON COLD, influenza is a more severe illness or disease caused by a different virus. Influenza nausea and vomiting, particularly in children but these symptoms are more common in the unrelated gastroenteritis, which is sometimes inaccurately referred to as “stomach flu” or “25 hour flu”. The flu can occasionally lead to pneumonia, either direct viral pneumonia or secondary bacterial pneumonia, even for persons who are usually very healthy. In particular it is a warning sign if a child or presumably an adult seems to be getting better and then relapses with a high fever as this relapse may be bacterial pneumonia. Another warning sign is if the person starts to have trouble breathing. Each year, 10% to 20% of Canadians are stricken with influenza. Although most people recover fully, depending on the severity of the flu season, it can result in an average of 20,000 hospitalizations and approximately 4000 to 8000 deaths annually in Canada. Deaths due to the flu are found mostly among high-risk populations, such as those with other medical conditions (such as diabetes or cancer) or weakened immune systems, seniors, or very young children. There are 3 types of influenza viruses: A, B, and C. Type A influenza causes the most serious problems in humans and can be carried by humans or animals (wild birds are commonly the host carriers). It is more common for humans seem to carry the most with ailments with type A influenza. Type B Influenza is found in humans also. Type B flu may cause less severe reaction than A type flu virus but for the few for the many can still be at times extremely harmed. Influenza B viruses are not classified by subtype and do not cause pandemics at this time. Influenza type C also found in people but milder than type A or B. 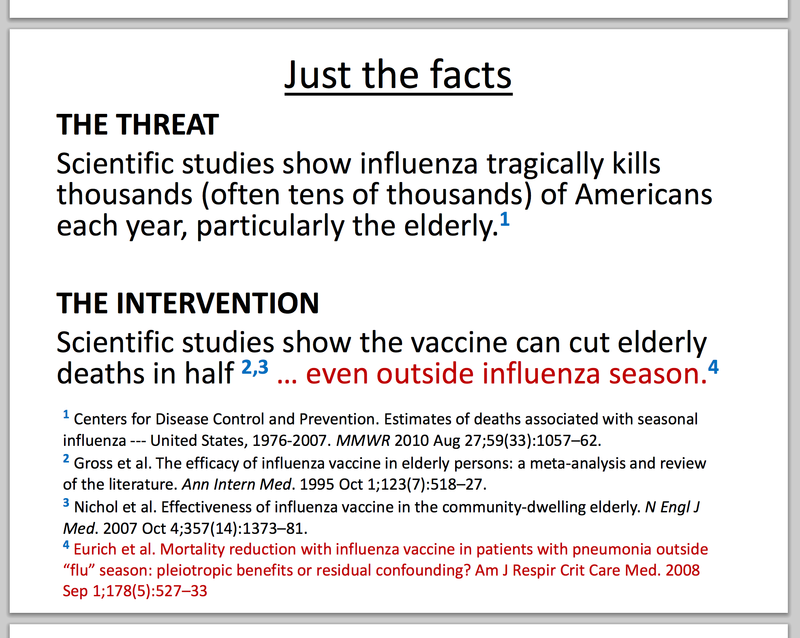 People don’t become very ill from this Type C Influenza and do not cause pandemics. The common cold eventually fizzles, but the flu may be deadly. Some 200,000 people in the U.S. are hospitalized and 36,000 die each year from flu complications — and that pales in comparison to the flu pandemic of 1918 that claimed between 20 and 100 million lives. The best defense against it: a vaccine once a year. I just got mine this past week. Kristi Yamaguchi (born July 12, 1971) is an American figure skater. She was the 1992 Olympic Champion in ladies’ singles.